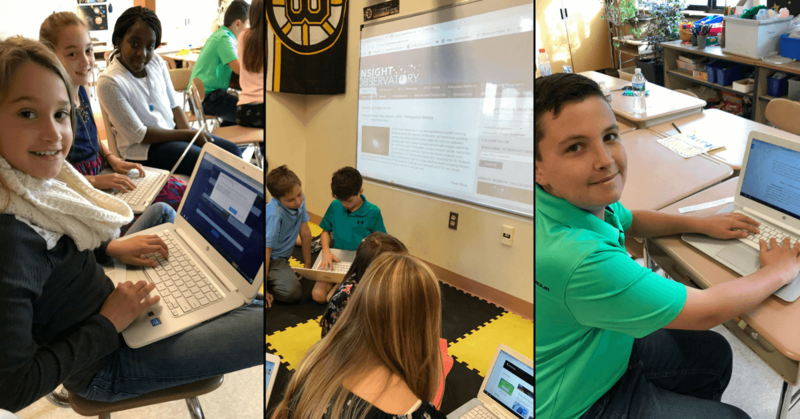 Students in Mrs. DeSantis' fifth-grade class at the Plymouth South Elementary School located in Plymouth, MA, used Insight Observatory's 16" Astronomical Telescope for Educational Outreach (ATEO) located at an elevation of 7,778 ft in the dark skies of New Mexico. 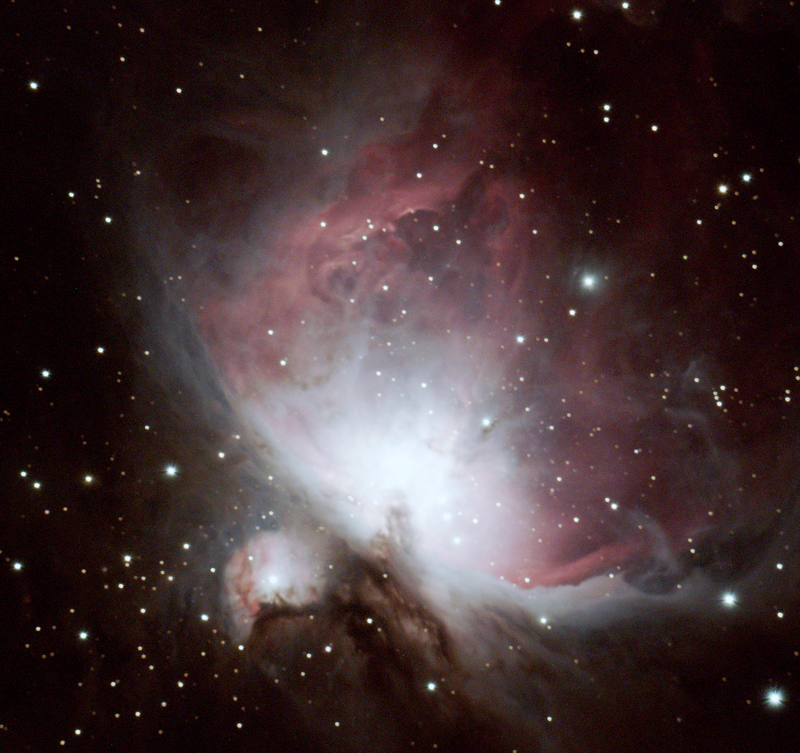 This telescope is accessed remotely via the internet as a rental and used from classrooms for students as well as the general public to conduct astronomical research projects for science education or deep-sky imaging. Students in Mrs. DeSantis' fifth-grade class queuing up their image requests for the ATEO. Mrs. DeSantis stated; "As part of our solar system unit, our fifth-grade class was offered the opportunity to receive some images via a remote telescope in New Mexico. The students were paired up and allowed to choose from a list of deep sky objects including nebulae, galaxies, and supernova remnants. They also had to choose whether to receive a color or a black and white photo as well as choosing the exposure time. Once they had chosen, we submitted the image requests under their names. They then created a Google Doc for their object and did some research on it. For example, if they chose a nebula, they had to explain what kind it was (planetary, emission, or diffused) and then elaborate. Students also visited the Insight Observatory website to learn more about the remote telescope. The kids were thrilled when the images arrived. 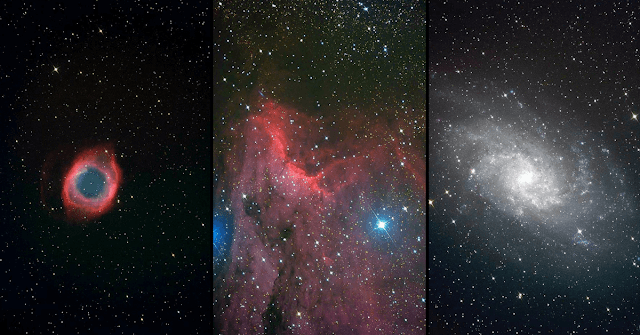 They compared the nebulae and discussed whether the type of nebula correlated to its appearance. This was a motivating and exciting project!" Insight Observatory had previously collaborated with the Plymouth Community Intermediate School also in Plymouth, MA, using remote robotic telescopes on a third party telescope network. 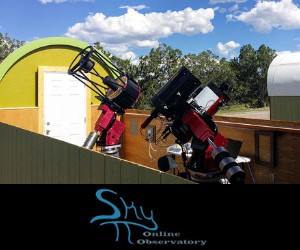 This is the first venture with the Plymouth school district utilizing their own instrument since the installation of the 16" Astrograph imaging telescope this past summer. From Left to Right: NGC 7293 - The Helix Nebula Imaged by Nolan and Ella, IC 5070 - The Pelican Nebula Imaged by Haley and Ava, M33 - The Triangulum Galaxy Imaged by Kassidy and Liam. The images above are just a few of those taken by the students. All of the images acquired by the class can be seen on their online gallery.